1) If the laptop is connecting using wireless if the wireless connection breaks, the files cannot be moved back. 2) If the user just closed the laptop lid without logging off from the network, again the files remain on the network are not moved back. If ReportComplete is copied to the root of of the C: drive it will operate in Laptop mode. 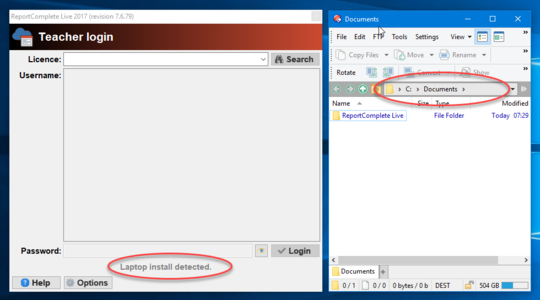 If you have done this correctly then ReportComplete will report that it has detected it is running on a Laptop drive. In laptop mode all files are saved in 'C:\Documents\ReportComplete Live', this folder will be created if it doesn't exist. If the teacher does not have R/W access to the root of the C: drive then they may need to install updates manually by downloading ReportComplete from our website and copying over the existing file in C:, they will be prompted by the operating system for permission or the computer's administrator password. This page was last modified on 15 May 2017, at 22:50.